We’re big fans of podcasts here at Pixlr HQ. One of our favorite local podcasts is 99% Invisible, a podcast about the design details in everyday life that often go unmarked upon or missed while we all hurry about in our modern day life. 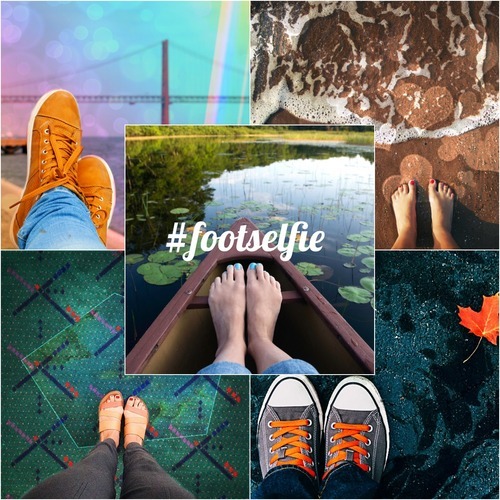 One of their recent podcasts, PDX Carpet, got us thinking about foot selfies. We’ve all taken them. Maybe wearing your favorite new shoes. Your feet about to be engulfed by surf at the edge of the ocean. You found an ice cream cone that toppled to the ground and decided to get a shot of your feet discovering it. Taking a foot selfie seems to be almost as natural as taking a regular selfie — although it sure feels a lot less narcissistic. Some of us have ugly feet, but foot selfies aren’t really about beauty. People usually keep their shoes on. It’s really all about seeing the world from a different perspective. Use of editing effects. You can use any Pixlr editing effects you want. If you love Cosmic Geometry or Skyfell, by all means use those. Or light leaks and old scratchy grungy filters. Whatever you think adds to your foot selfie.. If you’ve never done a lot of editing using effects or overlays, the bokeh effects are a great place to start. Use any of our apps you prefer: Pixlr Desktop, Pixlr for mobile, or Pixlr on the web. Or even Pixlr Editor if you’re the graphic design type and want to do something extra creative. Tag your images with both hashtags #pixlr #footselfie and share what you edit for this challenge on Instagram, Twitter, Facebook, Tumblr, etc. We’ll be on the lookout across our social feeds for these hashtags all week long. The reward? Pure glory. We’ll be featuring our favorites on our feeds through Sunday, including this blog.